Sometimes it’s not enough just to bet on brackets in the spring. Fans can enhance their excitement and engagement with the game all season by playing fantasy basketball. In the fantasy game, players built imaginary teams selected from players across the league. Participants follow and bet on the performance of their “team,” which is based on the statistics of individual players, across the season. Here is an online game that I am playing. My task: To water my flowers and to defend my “contraption”, on the right side of the screen, from the burny thingies that march over the hill from the left. My weapon: water balloons that I can fill on my contraption (until they sometimes burst) and flip (with a swipe of my finger) at the hot enemy hordes, thus extinguishing them. The challenges vary. Sometimes, there are just a few fiery intruders. If I throw high and hard enough, I can catch them as they first enter my space. Sometimes, though, I miss them. They toast my flowers and come right up to the foot of my contraption, trying to burn it down. No time to fully fill balloons then. Just a quick squirt and then fling, fling, fling the flaccid bags down to protect the contraption base. How well I performed, through sixteen challenges, may offer a clue to where my strengths as a worker lie. Am I a strategic thinker? Am I quick? Do I think ahead to protect the flowers at my base when there is leisure to do so? The game is called “Balloon Brigade”, available as a free iPad or iPhone download from Knack (http://knack.it), a San Francisco-based company that aims to analyze potential employee strengths based on game play. 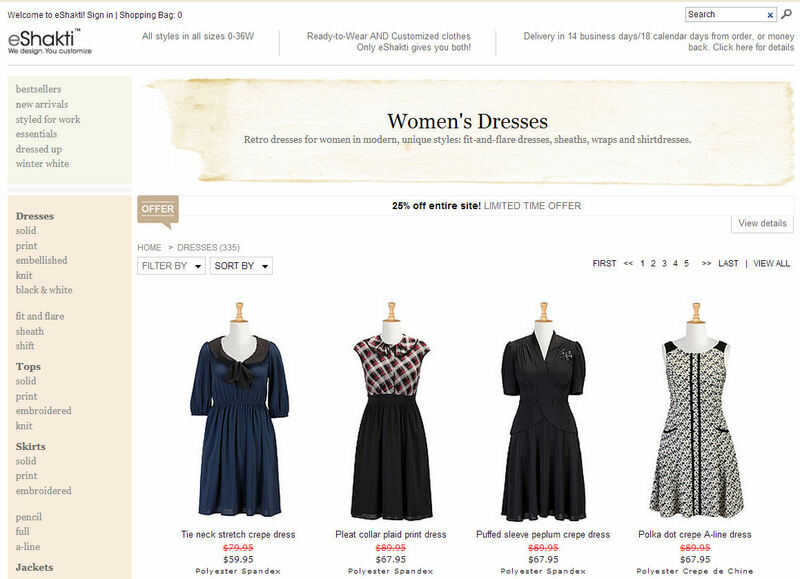 In a discussion among my online friends about web-based custom dressmakers, one name recurred: eShakti. Founded in 2001, the site “specializes in mass-customization of designer clothes for women.” “These are much drooled over by ladies I know,” writes cataloging professor Cheryl Tarsala. eShakti offers a selection of stylish dresses, tops, skirts and jackets in sizes ranging from 0 to 36W. The garments can also be cut to custom measurements, since the clothing is not assembled until it is ordered. Prices range from $39.95 – $129. Even though the clothes are made to order, in California, New York and India, they can be returned free of charge. “The business model is sheer genius,” writes Tarsala. My son Peter returned from his Oxford year abroad with his glasses in pieces. Time for a new pair! But he did not want those boring ones for sale at the neighborhood optometrist. As befitted his globetrotting scholar persona, my boy wanted a stylish pair of peepers. Yet Luxottica now has a competitor. Warby Parker (http://www.warbyparker.com) was founded in 2010 by University of Pennsylvania’s Wharton School classmates Jeffrey Raider, Andrew Hunt, Neil Blumenthal and David Gilboa. These gents aimed to provide stylish eyewear for reasonable prices by designing the frames in-house and then selling directly to the customer over the web or in their own stores, without middle-man markups. Many of their frames cost only $95 and none are over $150. In a charity bonus, for every pair that they sell, Warby Parker donates a pair of glasses to non-profit organizations like Vision Spring (http://visionspring.org). Peter admires the vintage-inspired design of Warby Parker glasses, and so he visited the site and uploaded his picture to virtually try on the frames. He chose five and had them delivered via the site’s “Home Try-On” feature, which allows customers to sample frames for seven days and then return them at no charge. It turned out that his virtual selections didn’t suit him in real life, so he visited Warby Parker’s Los Angeles store for his final selection. Still, his experience shows that it is now possible to purchase an accessory as unique as prescription eyeglasses entirely over the web. Android users in Los Angeles, San Diego, San Francisco, New York City, or Washington DC can find food trucks with the app TruxMap Lite, from Los Angeles developer Frank Pardo. (This free app is also available for iOS.) 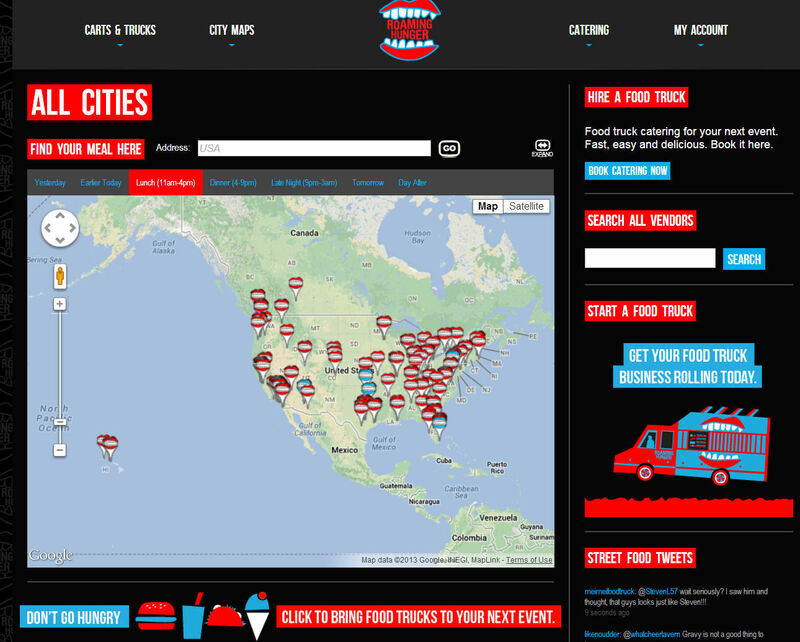 Pardo aggregates tweets about current and future food truck appearances and puts them on a map. 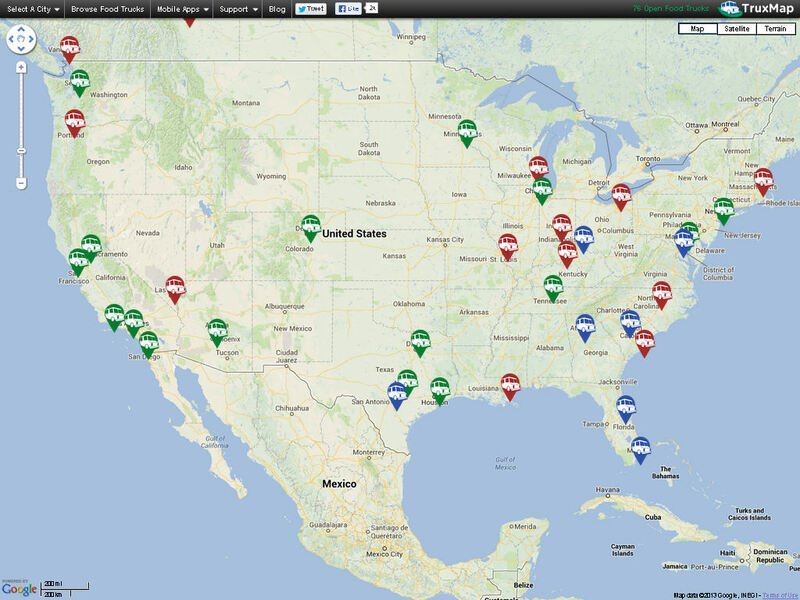 The information is also available on the TruxMap website: http://www.foodtrucksmap.com. This large map carries more information than the apps do. It covers 38 cities in the United States and Canada. As the food truck craze has grown and spread across the nation, web sites and apps have developed to help the hungry track down a mobile meal. The granddaddy of them all is Roaming Hunger, launched by Los Angeles entrepreneur Ross Resnick in 2009 to collate food truck tweets and to put them on a map. Roaming Hunger now follows food trucks in 34 cities and also features a search and booking function for registered trucks. Resnick even uses his site to offer advice to entrepreneurs thinking of starting their own food truck business. Roaming Hunger is available as a free iOS app that allows users to filter their food truck searches by “sweet”, “savory”, or “vegetarian”. There is no Roaming Hunger app for Android. Up all night, Chicago? Tune into Bill Leff’s show on WGN radio 720 to catch author Irene McDermott discussing web sites that can save you money on travel.